While visiting a local record store called Bobzbay, which also has video games and books, there was a random box of Garbage Pail Kids for a quarter each. 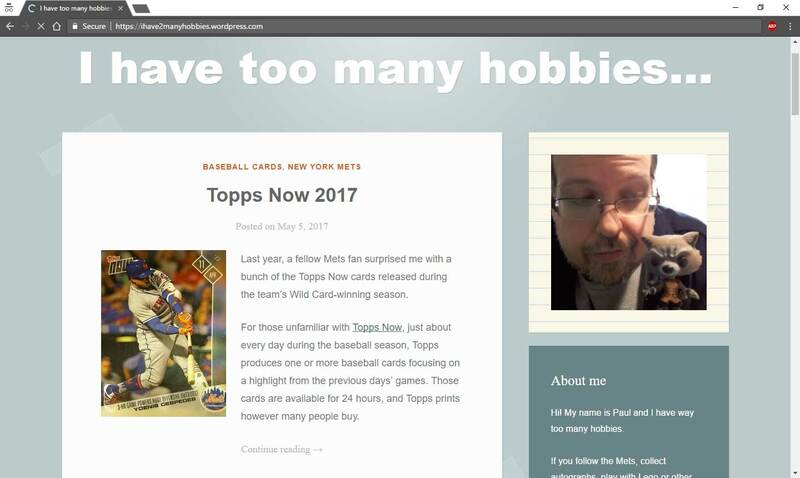 We are talking several hundred cards here and I would say someone basically walked in and sold their collection to the store. Although I love Garbage Pail Kids, I've never really wanted to build a complete set as some cards just don't interest me at all so I picked through the stacks and found several cards I've been looking for. There were no Series 1 or 2 cards in the boxes and so I imagine a set builder might have beaten me to the stacks. 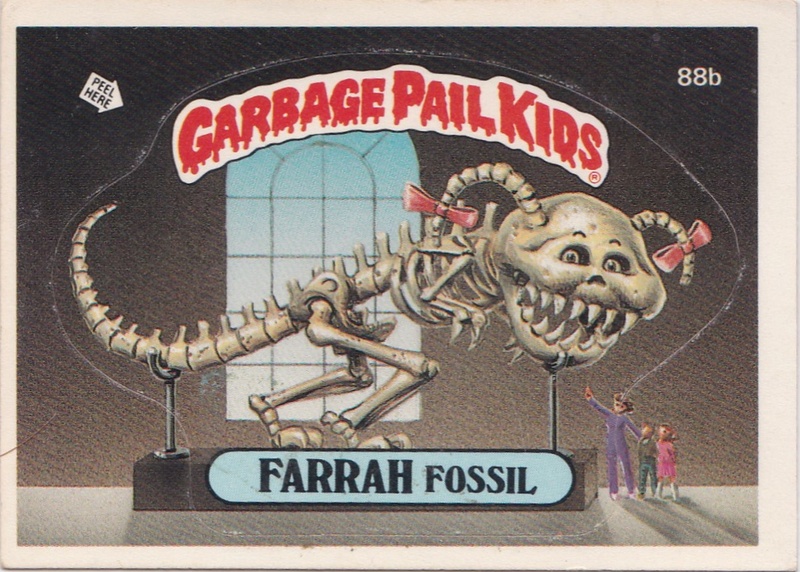 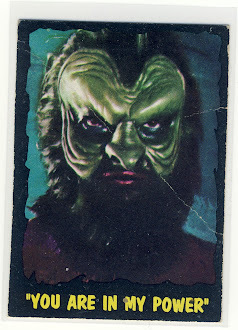 Most of my picks were from 1986 Topps Series 3 including the card below, Farrah Fossil. 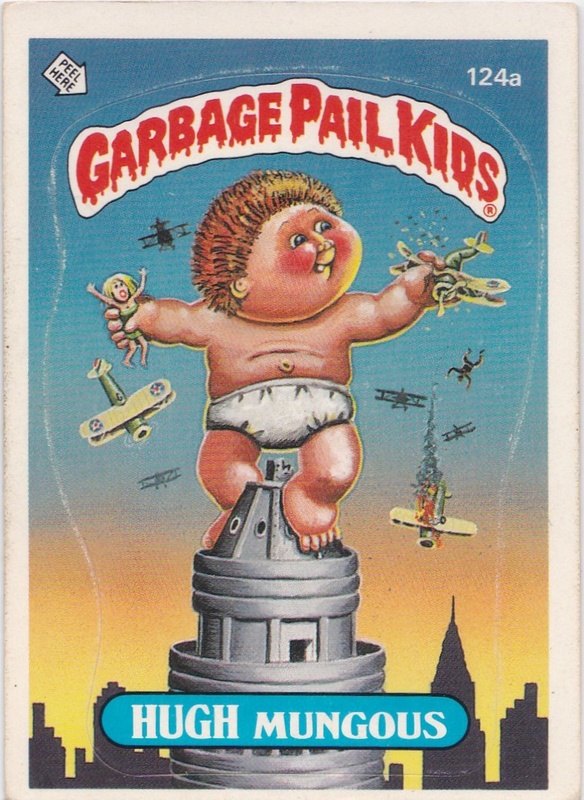 I saw what is probably the inspiration for this card this past summer when I spent a few days visiting New York City. 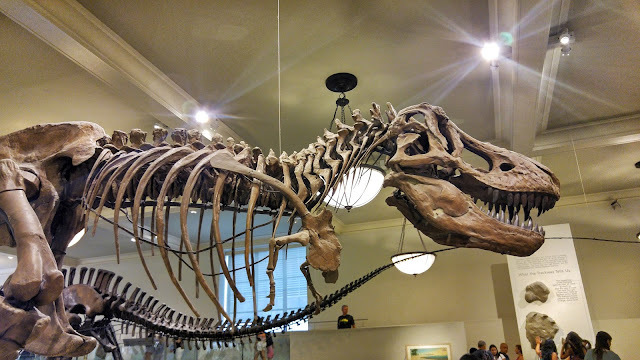 The T-Rex below is in the American Museum of Natural History with many other famous fossils. 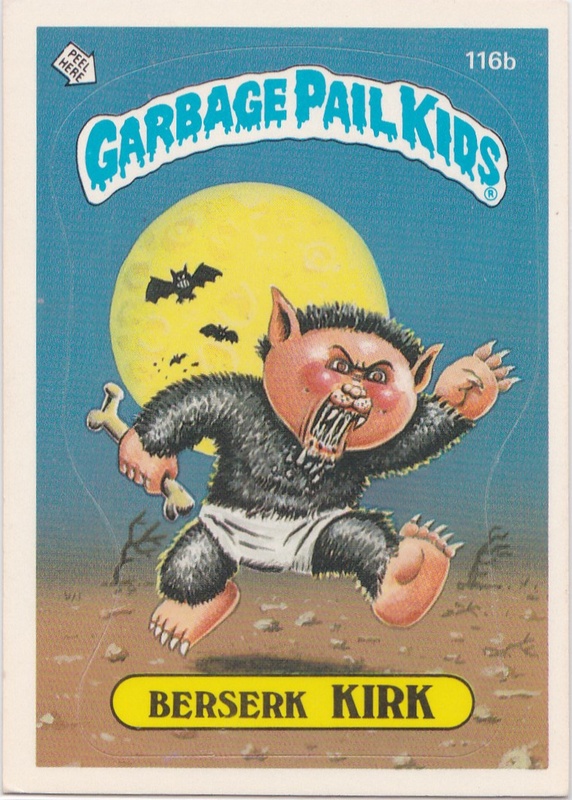 A "must buy" category of GPK cards for me is anything related to the Universal Monsters movies and so Berserk Kirk and Eerie Eric ripping off the Wolf Man are some of my favorites. They are both found in 1986 Topps Series 3. 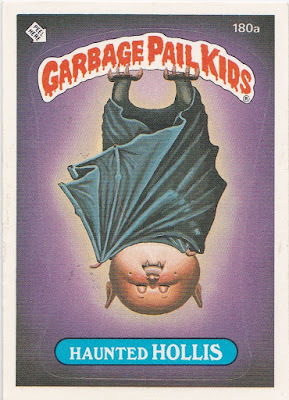 Haunted Hollis might be a young Dracula or maybe the original Bat Boy. 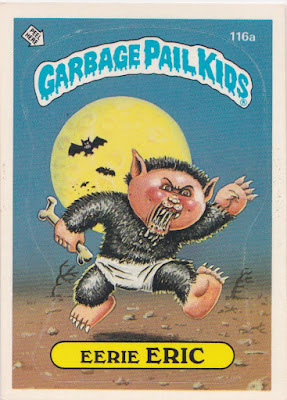 Although he's not a Universal Monster, Hugh Mungous parodying King Kong was an easy pickup too. 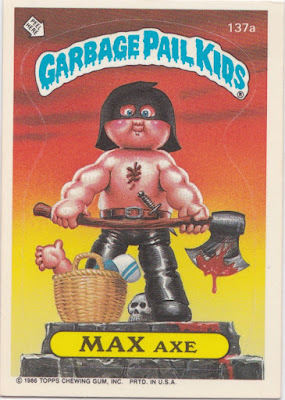 Max Axe can be found in 1986 Topps Series 4. 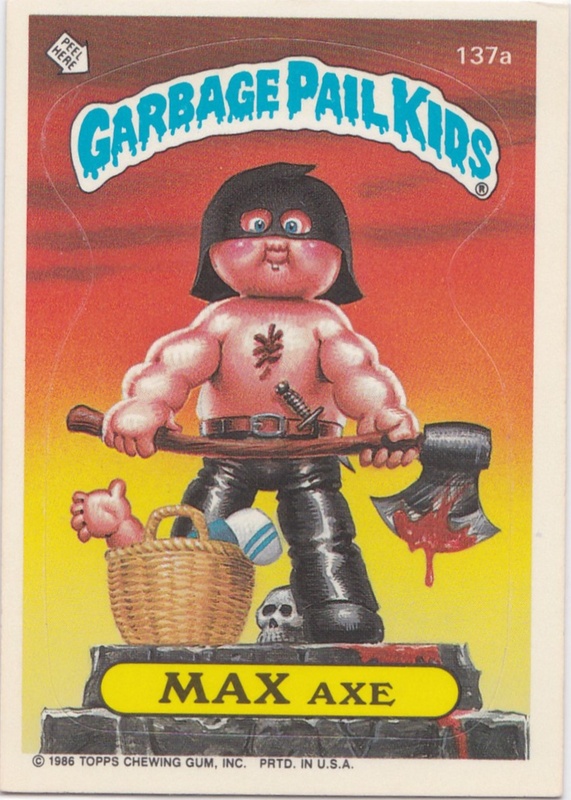 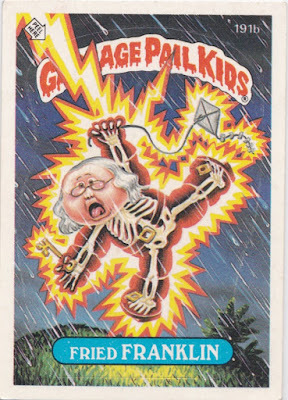 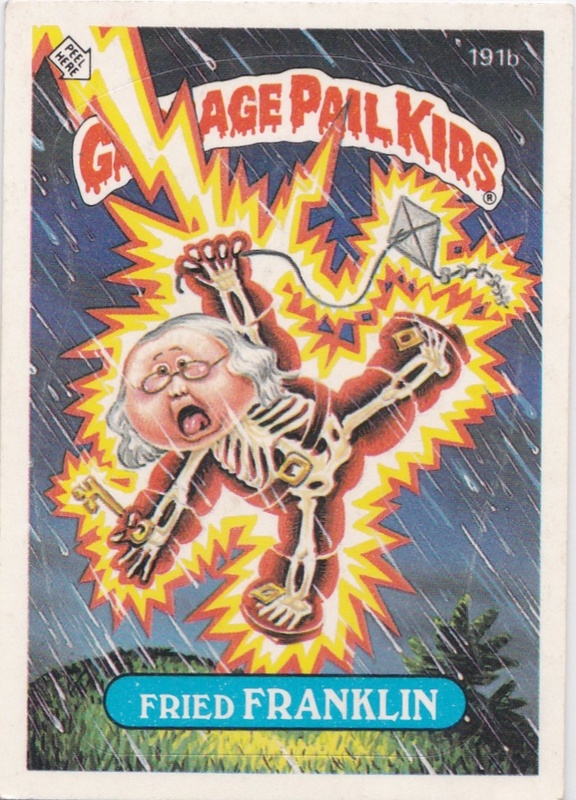 As a kid I wasn't allowed to own Garbage Pail Kids and if I remember correctly, violent cards, like Max Axe, were the reason. 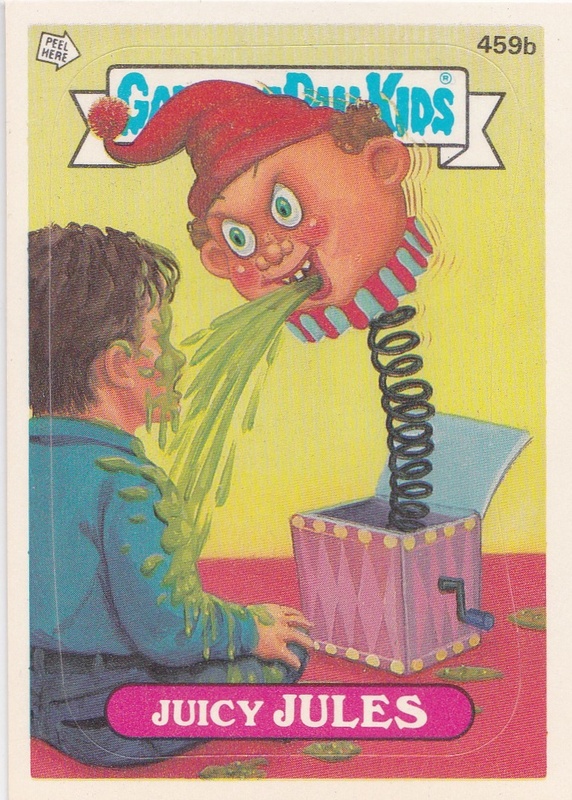 While joke cards about boogers and vomit might have slipped by, violent cards with body parts in baskets quickly drew the attention of the Parent/Teacher Association at my elementary school. To avoid the downfall of society, Garbage Pail Kids were banned throughout the land. 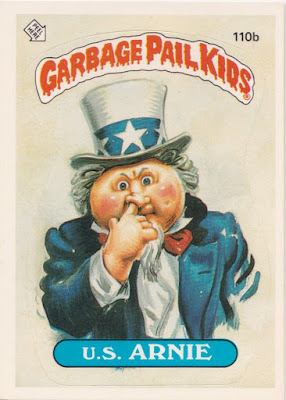 I'm a fan of political cards and here are two of my favorites including a take off of the Uncle Sam World War I recruitment poster in U.S. Arnie. 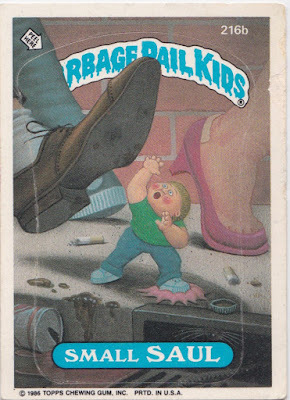 Small Saul is from 1986 Topps Series 6 and I had to pick this one in honor of Better Call Saul, one of my favorite shows. 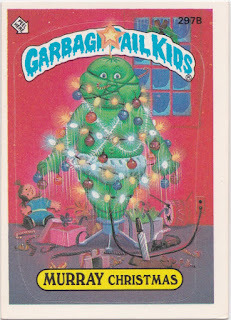 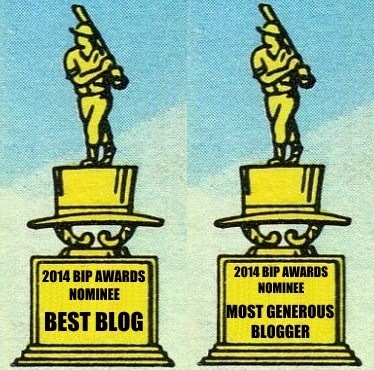 Come back to the blog around Christmas time and you'll find these two cards reposted to celebrate the holiday. 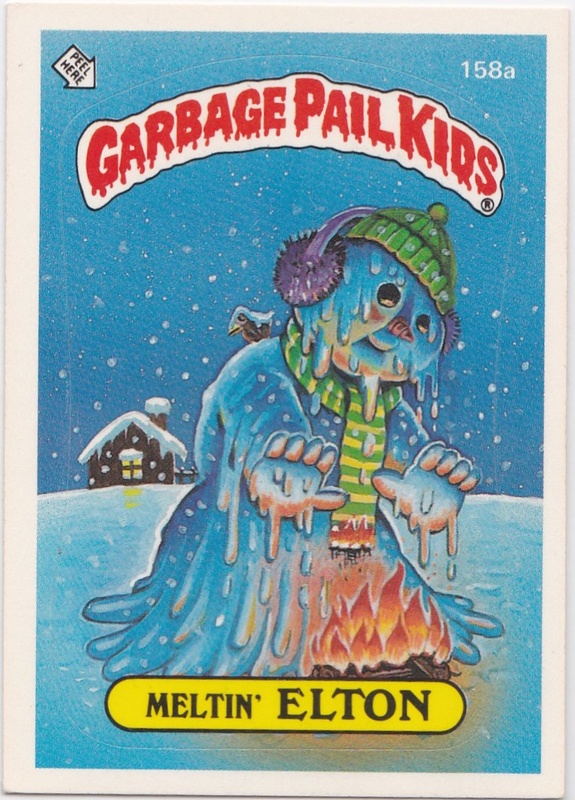 I'm always looking for Christmas cards to add to my collection and Murray Christmas can be found in 1987 Topps Series 8 and Meltin' Elton is from 1986 Topps Series 4. 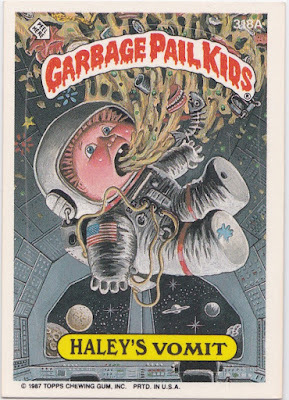 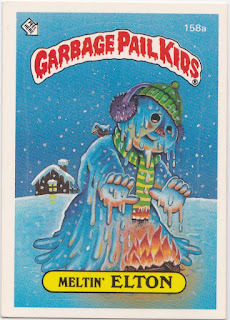 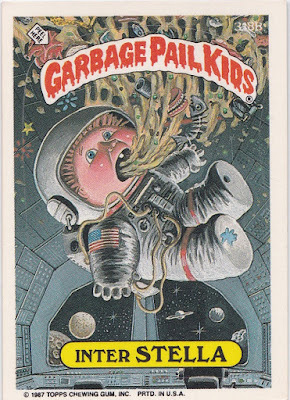 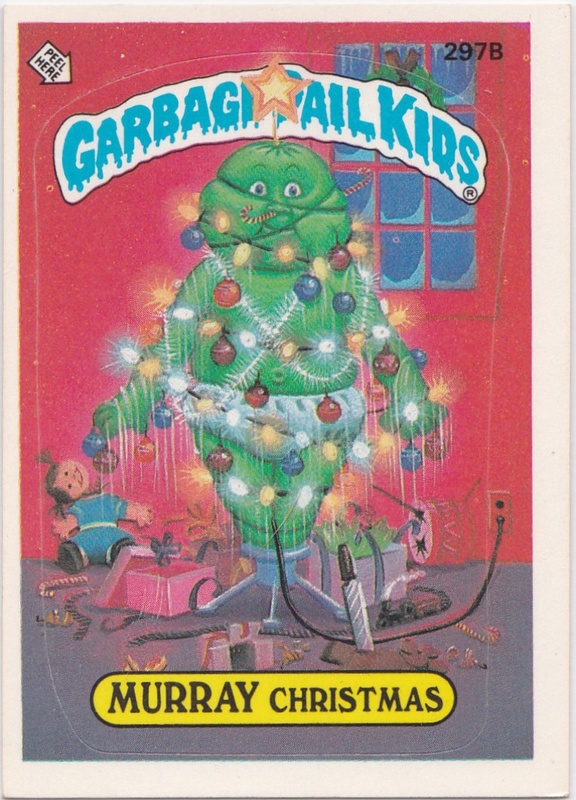 I collect every Garbage Pail Kids that deals with space and the Inter Stella and Haley's Vomit are two of my all-time favorites. These cards can be found in 1987 Topps Series 8. 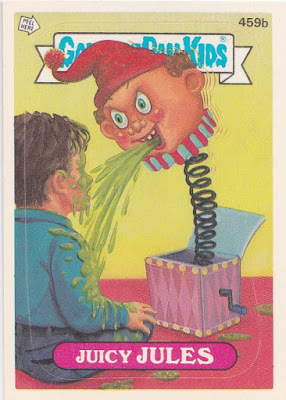 The last card from the group and the latest card printed from the group is Juicy Jules which comes from 1987 Topps Series 11. 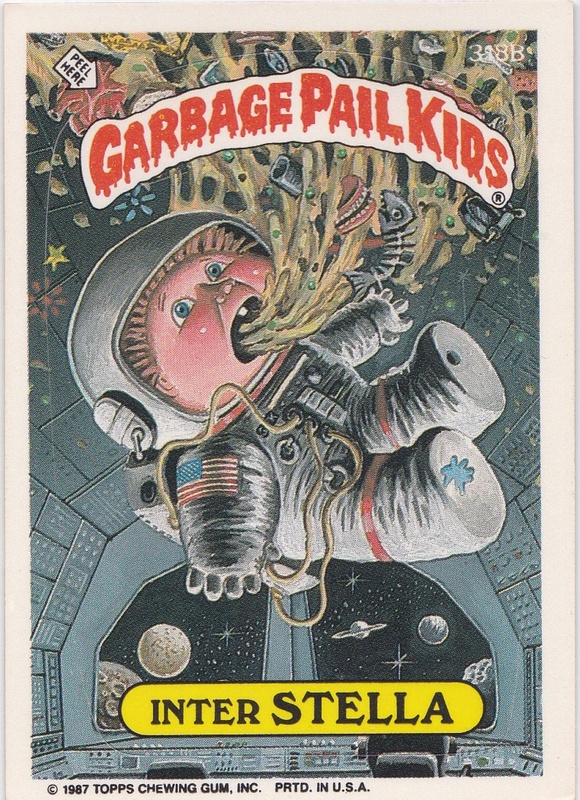 It is a clear takeoff of a horrific scene from the Twilight Zone episode "It's a Good Life" about an all-powerful child who has destroyed society and can "send people to the cornfield" if he is upset with them.